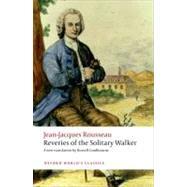 Rousseau's last great work,Reveries of the Solitary Walkeris part reminiscence, part meditation, as the philosopher tries to come to terms with his isolation and to find happiness in solitude and nature. TheReveriesare an important complement to Rousseau's other philosophical and autobiographical works and address many of the same issues, making it a useful introduction for anyone interested in reading Rousseau for the first time. Russell Goulbourne offers a fresh new translation that marries accuracy with readability. In addition, his Introduction discusses the nature of the work and places it in its historical, literary, and intellectual contexts. It considers theReveriesalongside Rousseau's other autobiographical work, notably theConfessions, and the form and style of the text in the context of the history of lyrical prose narratives, the rise of Romanticism, and works about walking. Finally, the book features detailed explanatory notes that enable readers to appreciate to the full Rousseau's ideas, ranging from biographical details to literary allusions, philosophical contexts, and the routes around Paris where Rousseau walked. Russell Goulbourne is Professor of Early Modern French Literature at the University of Leeds.